Alright, people, there’s a new cake in town. I love a classic cake just as much as the next gal (probably quite a bit more, actually), but there’s always room for a new take on cake, right? Technically, this dessert doesn’t have an ounce of cake in it – we’re just calling it cake because that’s what it looks like. It’s in a 9×13 pan and has sprinkles on top, after all. But that’s where the resemblance ends. So what’s this “cake” really made of? Oh, you know, just a layer of incredible fudgey brownie, topped with rich chocolate ice cream, topped with crushed Oreos and hot fudge, topped with creamy peanut butter ice cream, all finished off with a cool layer of whipped cream. 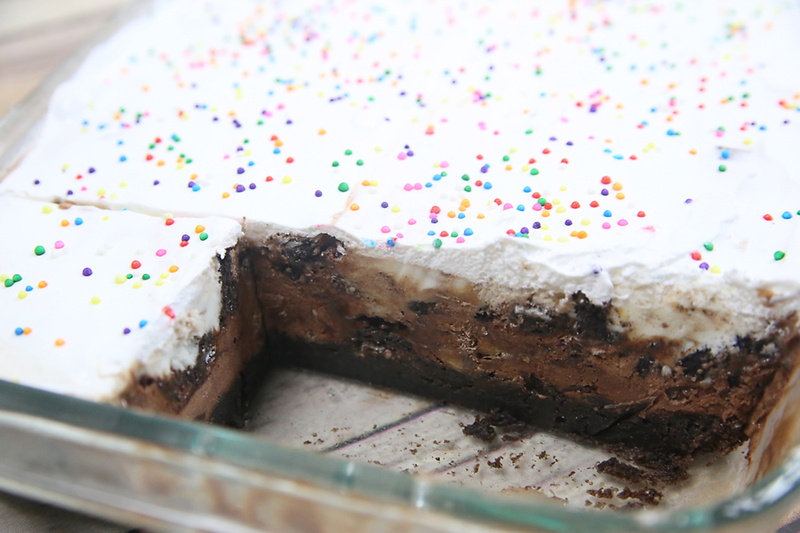 This is brownie bottom ice cream cake, and it’s amazing! Basically it’s made of indulgence and delight. 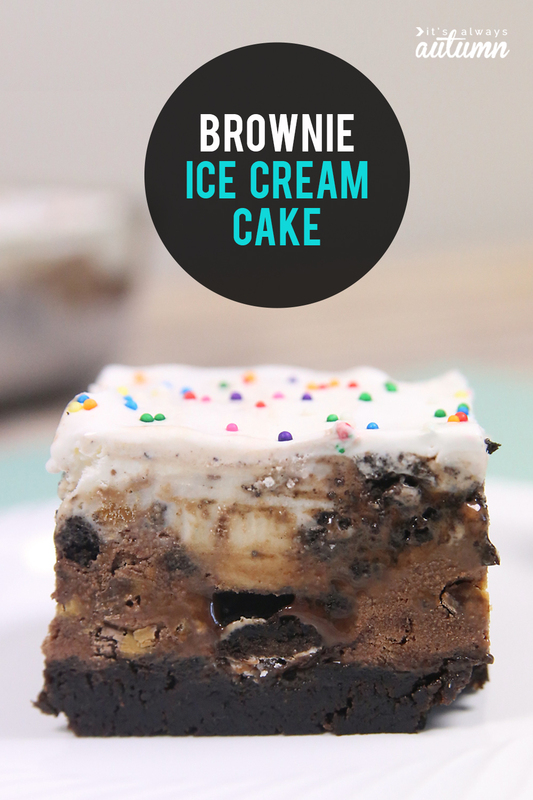 Imagine brownie, toffee ice cream, Oreos + caramel sauce, and chocolate ice cream. Or crushed Reese’s peanut butter cups in the middle instead of Oreos. Or mint and vanilla ice creams. Or dark chocolate ice cream and white chocolate raspberry sorbet! Yep, the sky’s the limit here. If you don’t already know your favorite grocery store’s ice cream section like the back of your hand, spend a few minutes perusing the selections next time you’re there and decide which flavors you’d like to combine into a cold, creamy bite of heaven. Okay, here’s is the printable recipe card (click on this link to download it). After the card are a few extra notes on putting this puppy together, as well as a quick video. 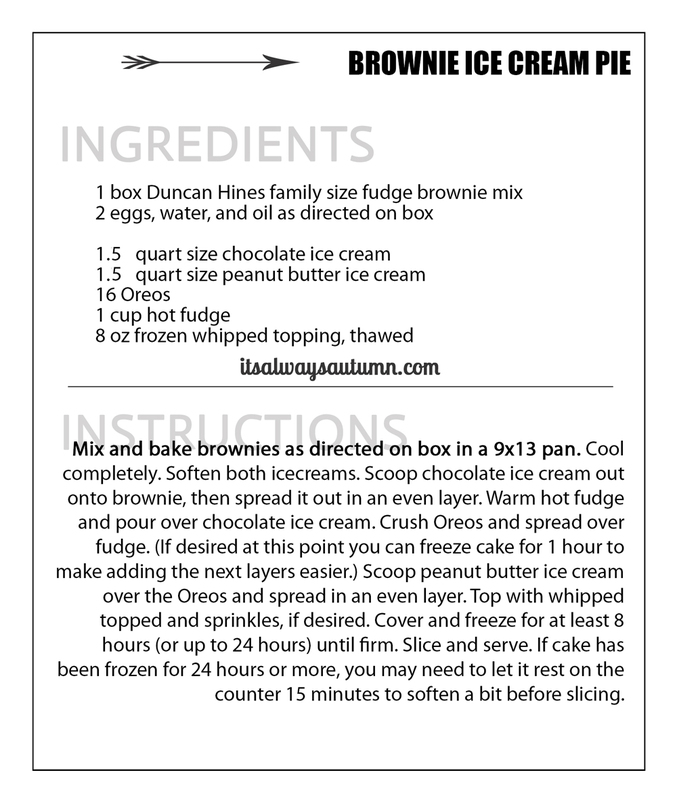 You can use any brand of brownie mix you like, as long as it is a 9×13 size, but I vastly prefer Duncan Hines. I make it with 2 eggs and cook it just until a toothpick inserted near the edge comes out mostly clean. Fudgey is key here. Plus you don’t want crunchy edges or you’ll never be able to cut through them once the dessert is frozen. If you end up undercooking the brownie layer a bit, no worries. It’s going to be amazing once it’s frozen. 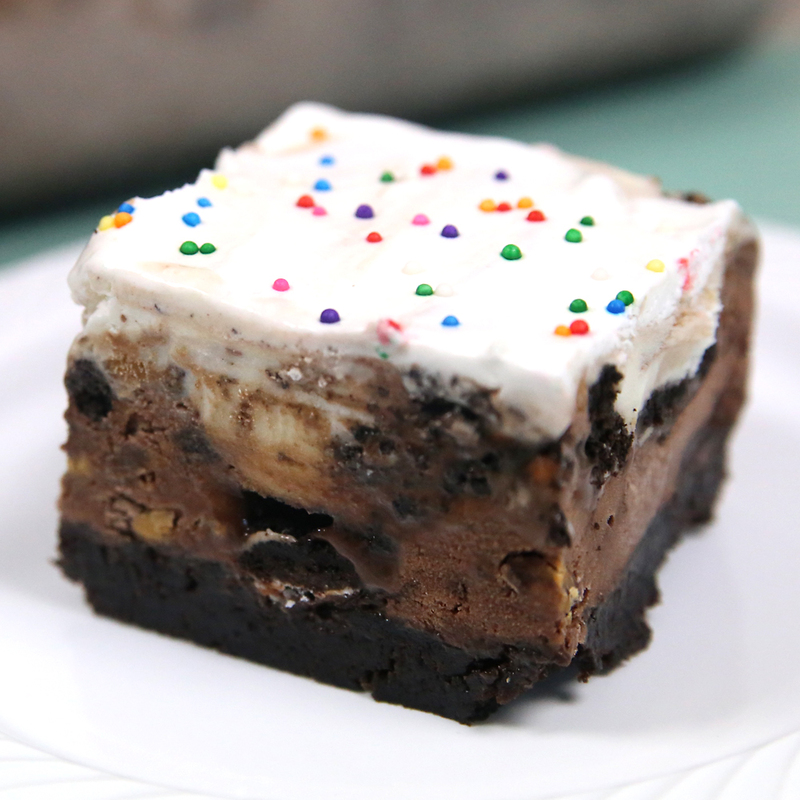 Make sure to soften your ice cream before you try to spread it across the brownie. You can either let it sit on the counter for a while or soften in your microwave. For best results, you can dump the entire container of ice cream in a large bowl and stir it up a bit to make sure it’s soft and spreadable before spreading it over the brownie layer. For more distinct looking layers, freeze the cake in between layers. So bake the brownies, let them cool, and add the first layer of ice cream, then freeze a few hours until firm. 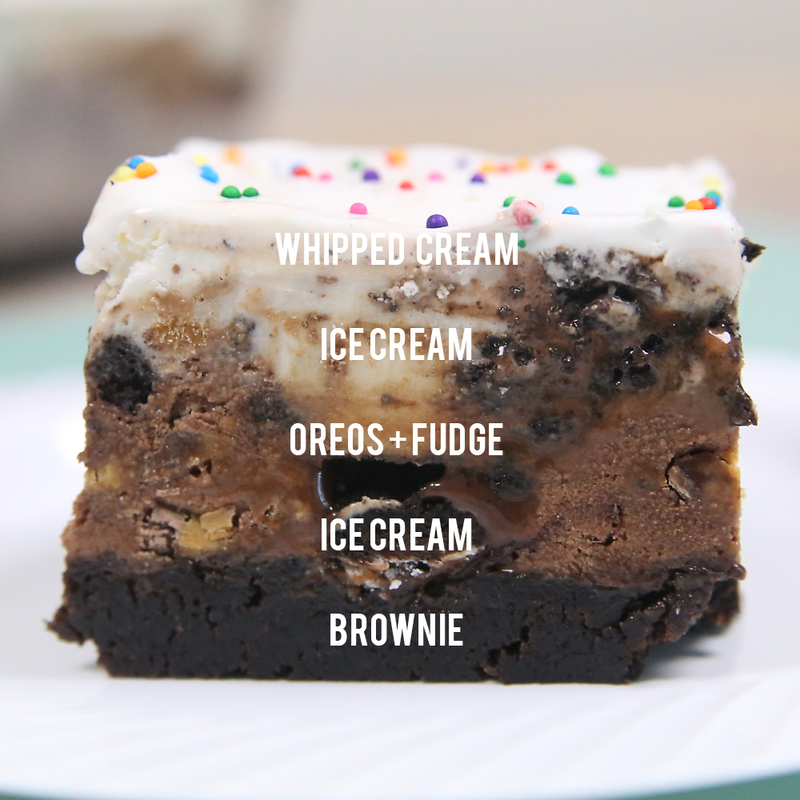 Then add the fudge/Oreos and freeze, then add the second layer of ice cream. I’m much too lazy to take the time to do this, so I just layer everything at once and don’t stress about the fact that the layers get a little muddled, but it will be a bit prettier if you take the time to do one layer at a time. Slicing this “cake” takes a bit of muscle. Definitely plan to let it sit on the counter for a few moments before you slice, especially if it’s been in the freezer overnight. Oh yum! With a birthday coming up soon, this may be the dessert of choice in my house! We are chocolate and peanut butter loves, so this is perfect! Good timing and thank you! This cake looks amazing – all of my favorite treats together.